The Chesapeake Bay watershed is home to a wide variety of landscapes, built upon diverse underlying geology. Many of the watershed’s most scenic areas have an interesting geologic story behind them. Some areas were carved by glaciers, while others are built upon ancient reefs. Some landscapes are mountainous, created by colliding continents, while in other areas caves formed as water dissolved away vulnerable rock. These eight sites across the watershed offer a snapshot of the ways different geologic processes can create beautiful natural settings and offer opportunities for exploration. Otsego Lake is the headwaters of the Susquehanna River and the Chesapeake Bay. The long, narrow lake was formed about ten thousand years ago, when a glacier scoured out the Finger Lakes region. Evidence of glacial activity surrounds the lake, with a field of teardrop-shaped hills at the northern end and a buildup of glacial debris known as a moraine at the southern end. Glacial sediments have filled in as much as 75 meters of the basin as well. 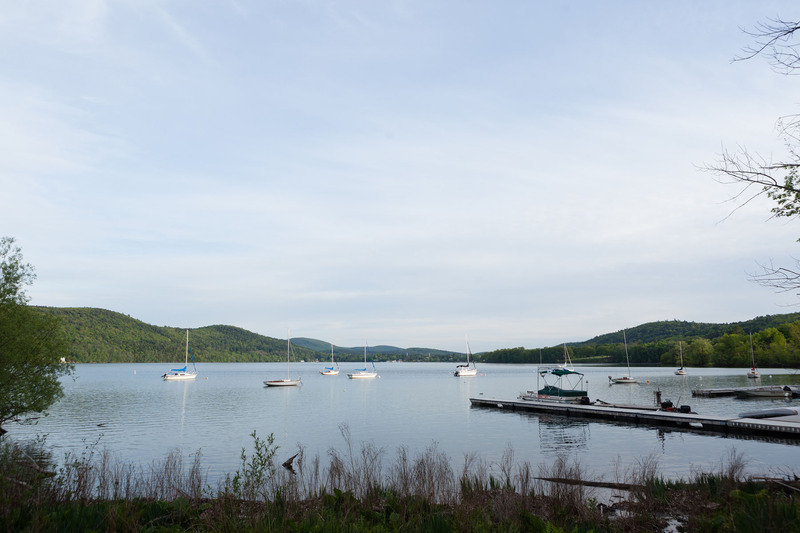 Otsego Lake, nicknamed “Glimmerglass” for its mirror-like surface, offers visitors more to observe than the evidence of glaciers. The area is popular for recreational activities like boating and fishing. 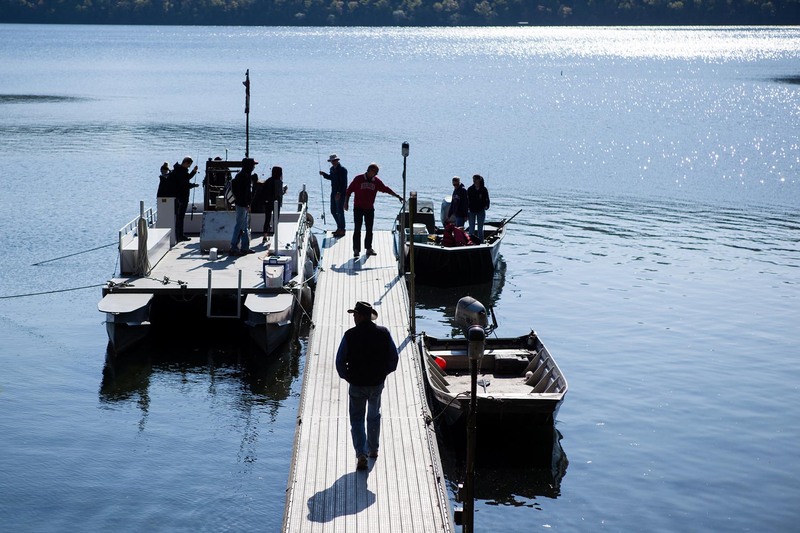 The lake is also the starting point for the annual General Clinton Canoe Regatta, a 70-mile race down New York’s portion of the Susquehanna River. Bald Eagle Creek cuts through Devonian-Period (420 to 360 million years ago) rocks and is a great place for fossil hunting. The rock layers around the creek were deposited during a time when Pennsylvania was about 30 degrees south of the equator and covered by shallow seas. The fossils found in the older rock layers are the remnants of ancient reefs, dominated by sponges, algae, coral and crinoids. Younger layers show deeper waters that were home to trilobites, brachiopods and mollusks. Visitors to Bald Eagle Creek can launch from the Milesburg Access Point to follow a fossil tour designed by the Pennsylvania Geological Survey. The tour covers five miles of the creek and includes four main stops to see the various rock layers. 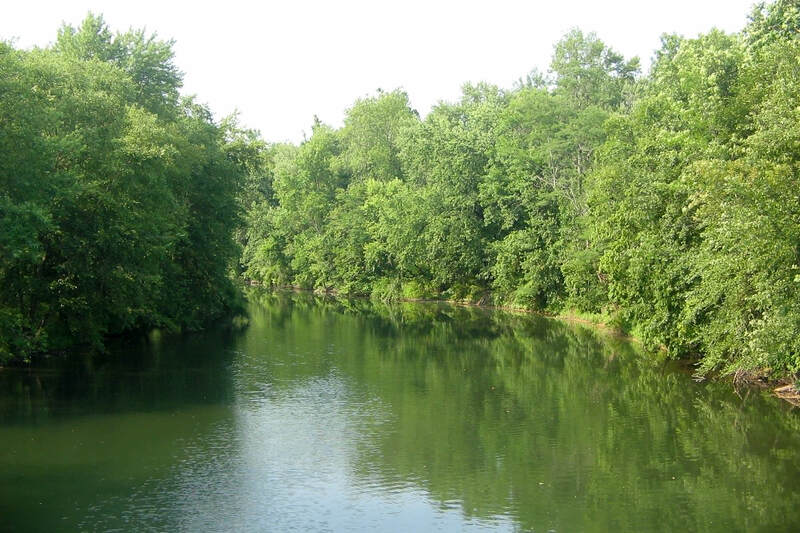 Bald Eagle Creek is also home to trout, bass, pumpkinseed and crappies, offering great opportunities for anglers. 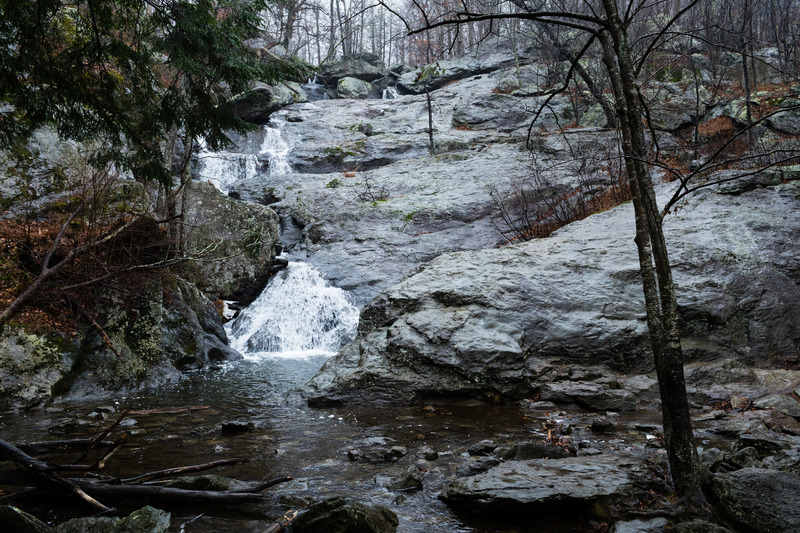 At 78 feet, Cunningham Falls is the highest waterfall in Maryland. The falls are located in the Catoctin Mountains, which is in the Blue Ridge Mountain range. The rocks in the area formed around 500 million years ago and began as igneous and sedimentary layers. During a continental collision 250 million years ago, folding and uplifting led to heat and pressure that metamorphosed the rocks. The area around Cunningham Falls today is made up of a metamorphic rock called metabasalt. Visitors to Cunningham Falls State Park can enjoy the geology of the area through hiking, swimming, camping, fishing and canoeing. The park offers a Scales and Tales environmental education program with live reptiles and birds of prey. The park also hosts popular annual maple syrup demonstrations, where visitors can watch park rangers show how maple syrup is made from sap and enjoy a pancake breakfast. 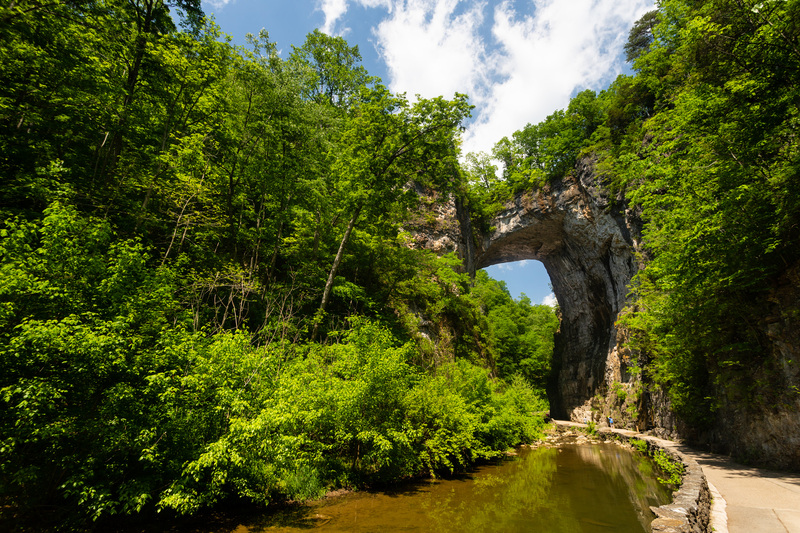 Thomas Jefferson, who once owned Natural Bridge, described it as “the most sublime of nature’s works.” Natural Bridge is a 215-foot-tall natural rock bridge located in one of Virginia’s newest state parks. The bridge, which is made of limestone, was carved out by Cedar Creek. Limestone is made up of calcium carbonate, which is easily dissolved by slightly-acidic surface or ground water. Landscapes made up of these calcium carbonate rocks are known as karst. Karst topography is often prone to sinkholes, caves and highly-sculpted landscapes. Visitors to Natural Bridge State Park can enjoy more than six miles of hiking trails. The park includes a wheelchair life and a free shuttle that make it very accessible. Natural Bridge Park is also home to Lace Falls and is near to the Caverns at Natural Bridge, which offers guided tours. Great Falls Park is located at the boundary between two distinct geologic regions: the Piedmont Plateau and the Atlantic Coastal Plain. This boundary is known as the Fall Line and is characterized by dramatic changes in elevation, creating the stunning cascading waterfalls at the park. The rocks that form the riverbed are dense metamorphic rocks, formed from sandstones and mudstones close to 550 million years ago. These rocks are incredibly resistant to erosion. 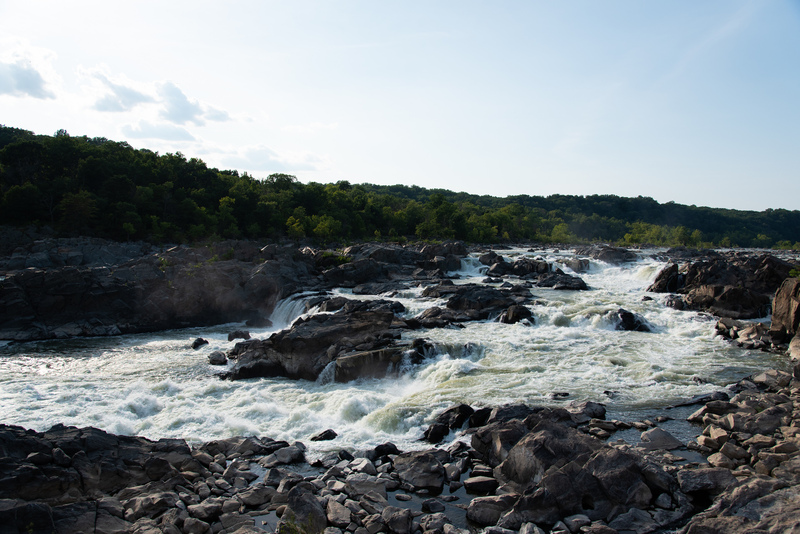 While the Potomac River is very slowly wearing the rocks down, today’s Great Falls looks almost identical to what George Washington would have seen when he visited to oversee construction of the Chesapeake and Ohio Canal. Visitors to the park can access views of the falls from both Maryland and Virginia. Those interested in a rock scramble can try the Billy Goat Trail A, while Overlooks Two and Three and the Patowmack Canal Trail offer more accessible options. Great Falls is also a popular destination for rock climbers, and the rapids offer a training ground for white-water kayaking. The Washington Monument is built from three different kinds of marble. When construction began in 1848, builders used marble from Texas, Md., for the first 152 feet. Due to a lack of funds, progress halted in 1854. When they began to build upwards again in 1879, they switched to marble from Sheffield, Mass. However, only four rows of the Sheffield marble were laid before delivery and quality issues led to another switch. The monument was finished with marble from Cockeysville, Md. Visitors can look for slight color differences between the marbles that give away the change. The monument’s challenges don’t stop there: the underlying geology of Washington, D.C. is causing the monument to slowly sink into the ground. Much of the terrain in the area is soft, without hard bedrock to support the buildings. 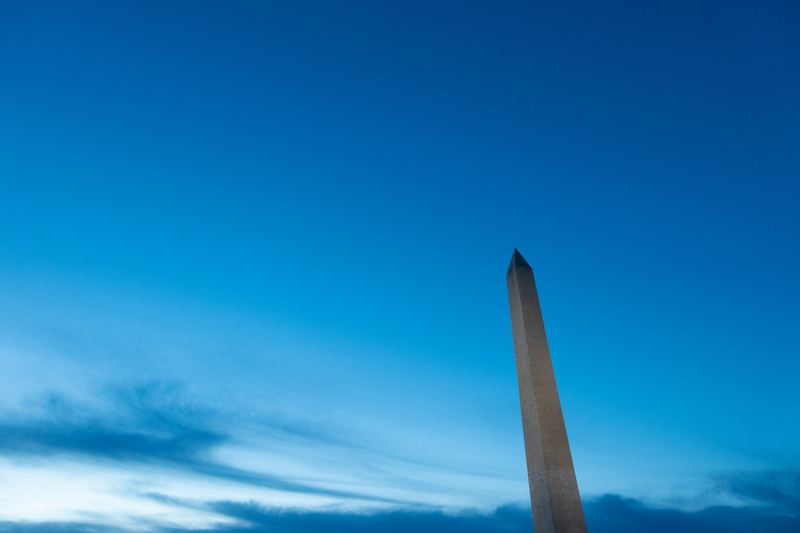 The first site proposed for the Washington Monument had to be abandoned completely. At the present site, builders discovered that the monument was sinking and tilting when they resumed work in 1876. The next three years were spend building out a massive subfoundation to stabilize it that reaches down nearly 40 feet. Even with the foundation, the 555-foot monument still sinks a small fraction of an inch each year. The Chesapeake and Delaware Canal is a 14-mile waterway that connects the Chesapeake Bay and the Delaware River. It’s also one of the best spots in Delaware for fossil collecting. The excavation of the canal exposed several rock formations dating back to the Cretaceous Period (146 to 66 million years ago) that contain fossils of shallow-sea animals. In addition to various clam and oyster shells, the layers also contain belemnites—the state fossil of Delaware. 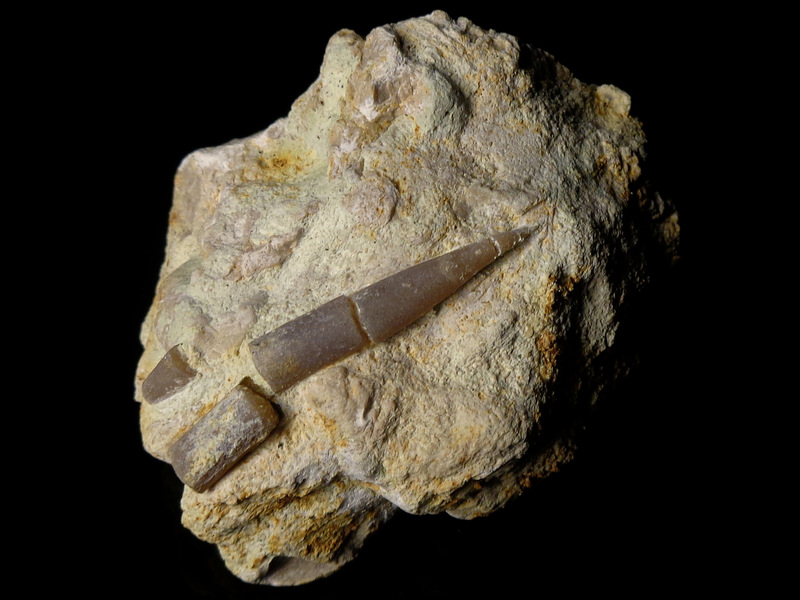 Belemnite fossils come from an extinct cephalopod similar to a squid. The fossils are part of the inner shell called the guard, which counter-balanced chambers filled with air for buoyancy. The canal offers a connection between the Ports of Baltimore and Philadelphia and was one of the most expensive canal projects ever undertaken in the country. The canal is also on the National Register of Historic Places. 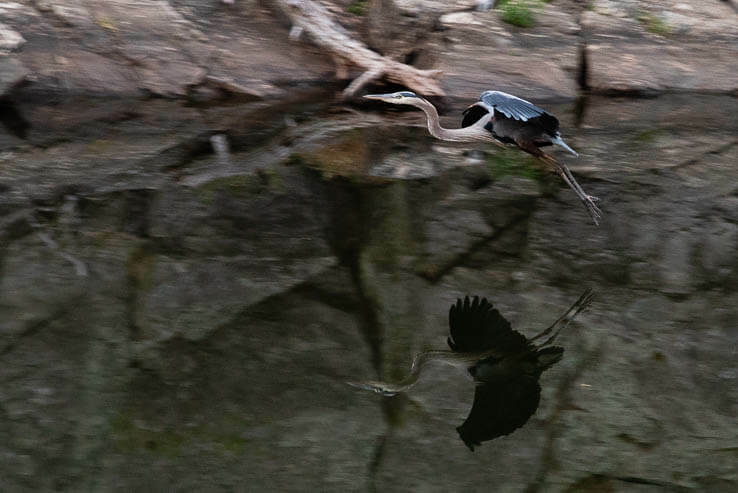 In addition to fossil hunting, visitors to the Chesapeake and Delaware Canal can enjoy the hiking and bicycle trails that run along the majority of the canal’s shores. 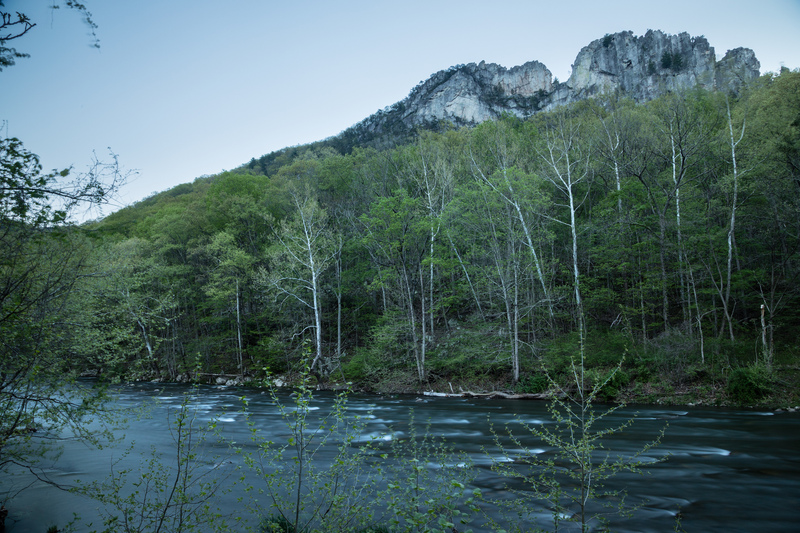 Seneca Rocks is one of the most popular rock-climbing destinations on the East Coast. Rising 900 feet above the North Fork River, the Seneca Rocks formation is part of the Wills Mountain anticline, an arch-shaped ridge that extends for more than 200 miles through parts of Pennsylvania, Maryland, Virginia and West Virginia. The ridge formed more than 200 million years ago when two tectonic plates collided, causing the formation of the Appalachian Mountains and the rock layers to be uplifted and tilted vertically. Over millions of years, the softer rock layers eroded away, leaving behind the resistant Tuscarora sandstone. The Silurian-age (438 to 408 million years ago) Tuscarora makes up Seneca Rocks, as well as other prominent geologic features along the anticline like North Fork Mountain and Greenland Gap. Even if you aren’t a rock climber, you can still enjoy the scenery at Seneca Rocks. A 1.3-mile trail with switchbacks leads hikers up to an observation platform with beautiful views. The Seneca Rocks Discovery Center offers views from the base as well as information for visitors. Seneca Rocks is also close to three of West Virginia’s State Parks, including the popular Blackwater Falls. Learn more about the geology of the Chesapeake Bay watershed. Call attention to more of Maryland’s exciting geology - Sidling Hill is amazing. Thank you for your interesting posts. I want to visit the sites you mentioned which I have not yet seen. Very nice article. I have lived in the region all my life and some of the features I never knew about. Thanks for sharing.